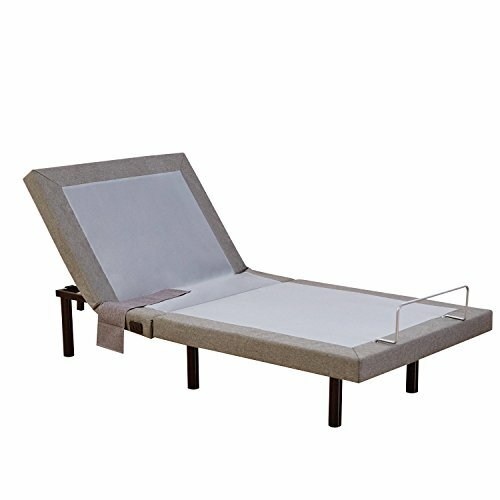 Adjustable Bed - DON'T BUY BEFORE YOUR READ THIS! Insomnia can be reduced when you are able to find the most comfortable position to sleep in. Its also easier to fall asleep when your circulation and oxygen flow is optimal. Snoring happens when you’re lying flat because extra weight is placed on the windpipe. After adjusting your bed to lift your head gravity pulls the weight away from the windpipe and reduces snoring. Being able to change the position of the bed also helps to improve other breathing problems. Being able to adjust your bed both at the feet and head gives your back and spine a more supportive sleeping position. It can also relieve pressure on the sciatic nerve. Certain sleeping positions can improve your blood flow and oxygen flow which can speed up the time it takes to fall asleep. Adjustable beds allow you to shift pressure away from problem areas and reduce stiffness. Being able to not lie flat improves your bodies ability to digest. Being able to adjust to the perfect position for sleeping or watching television makes it easier to feel comfortable and relaxed. Having an adjustable bed is a great way to improve your sleep and relaxation. You can watch TV from a much more comfortable position when you get home from work. You’ll notice that you have better sleep. There are numerous position that you can achieve with a motorized adjustable bed. Here are some of them: We’ve previously discussed how important good sleep is for improving your anxiety. Adjustable beds can significantly improve your well-being. Please make sure that your existing mattress will work with the adjustable bed that you choose. If you are ordering a mattress at the same time please make sure its compatible. I hope you enjoy this report and find the perfect adjustable bed for you. 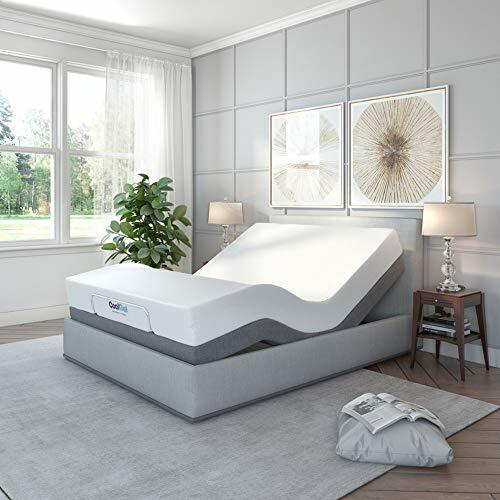 The Tempur-Ergo by Tempur-pedic is a high-end high quality power adjustable bed base. You can buy it in normal or split configuration if you want you and your partner to have your own individual settings. You can raise your head up to a 70 degree angle and your feet to 40 degrees and all the angels in-between for a perfect fit. It comes with a wireless remote control and can store up to 2 preset positions. It can support up to 650 lbs and is backed by a full 3 year warranty. Its my pick for #1 because of its quality and that its made by Tempur-Pedic. On the downside, its pricey. But, you know you’re getting solid product that will last for many years. The S-Cape by Legget & Platt is a formidable well made power adjustable bed base. It comes with an ultra-quiet motor that has a 700 lbs capacity. You can get it in regular or split design. Keep in mind the split design is much more expensive. A great plus to this mattress is that it has a dual massage function built-in (head and feet). It has an easy to use wireless remote control. Its a very close runner up to my #1 winner. It takes the #2 Winner’s place because some people have complaint of quality issues and defective motors. 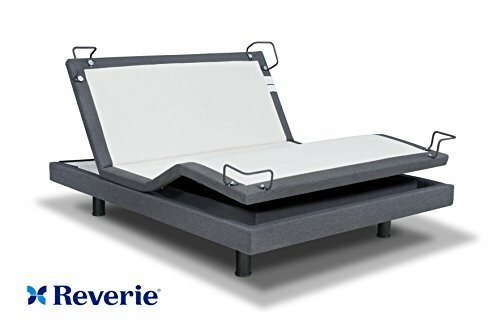 The Reverie 8Q is a fantastic well built power adjustable bed base. Its actually also made by Tempur-Pedic. It comes in standard and split formations for you and your partner to enjoy. This bed base allows you to elevate your head and feet to almost any angle ensuring maximum comfort. It features bluetooth so you can pair your phone with it and and control it that way. It features a gentle and quiet massage with 10 different intensities. Another great feature is that this base allows you to adjust the pillow tilt angle. You can also program it to change positions after a set time period automatically (for when you’re asleep). I love that it comes with an under bed night light as well. This is a feature rich high tech adjustable bed base. 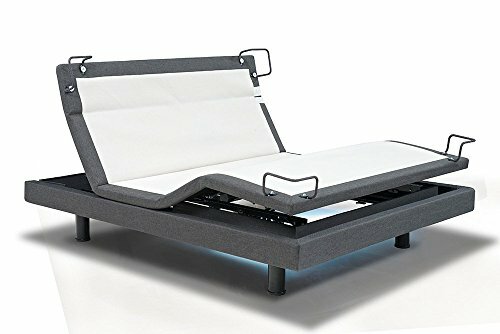 It would the spot as a #1 Winner or #2 Winner but people didn’t love the 4 mattress retaining hooks in the corners on this adjustable bed base. They can get in the way when you are tucking the bed sheets in. If that doesn’t bother you this is the adjustable bed for you. The Reverie 7S is a great adjustable bed and it comes in at such a great price. You get some of the features of the more expensive Reverie 8Q. You can order it with optional bluetooth for similar functionality that is found in the 8Q. You can use the app on your phone to control the bed. It also comes with a wireless remote control and massage feature with 10 intensity levels. Its made by Tempur-Pedic so you can be sure its good quality. This bed is a great deal and great buy and thats why its our #1 Winner for Best Value. The only thing that isn’t the best on this bed is the 4 corner mattress holders. The Tempur-Up by Tempur-Pedic is a great well thought out power adjustable bed base. You can raise the head of the bed up to 55 degrees. Its a great quality base for a great price. It comes with a non-wireless remote. It takes our #2 spot simply because it doesn’t have a motor to adjust the angle of the feet section of the bed. 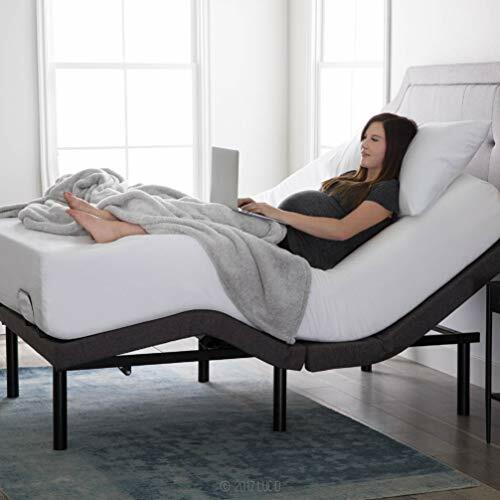 Its a good choice if you just want to be able to elevate the head of the bed, and want to spend less money. You can be sure its great quality as its made by Tempur-Pedic. The Phoenix Plus is an excellent adjustable bed base. It comes with a wireless remote and has a wall-hugger design. That means it stays as closer to the wall when its up at an angle. It has an 850 lbs capacity. The remote is back lit and has a one-touch flat button. The remote also comes with a convenient flashlight. The base itself has a fantastic 1 inch thin profile that fits inside the frame of your bed. This is a great buy. The only reason its in the #3 Winner position is because you may not need to spend the extra money for the wall-hugging feature. 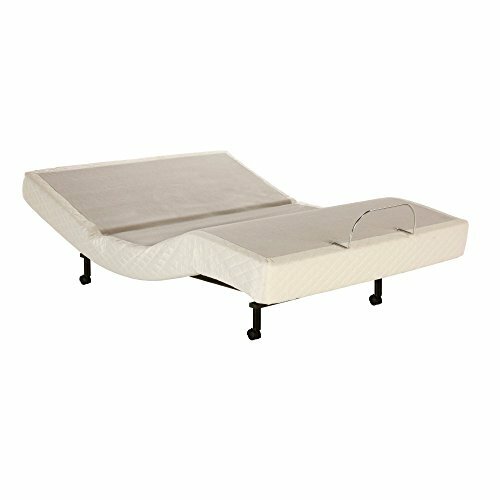 The Classic Brands adjustable bed is a very popular highly reviewed product. It has mostly 4 and 5 star rates from thousands of people. It offers many premium functions for a great affordable price. It comes with dual head and foot massage as well as USB ports. You can adjust both the head and feet sections of the bed. It is programmable so you can have custom settings for TV viewing, sleeping and zero-gravity positions. On the downside some people have said that it doesn’t have the build quality of the more expensive bases. If thats not a deal breaker for you, its sure to get the job done and save you some cash as well. 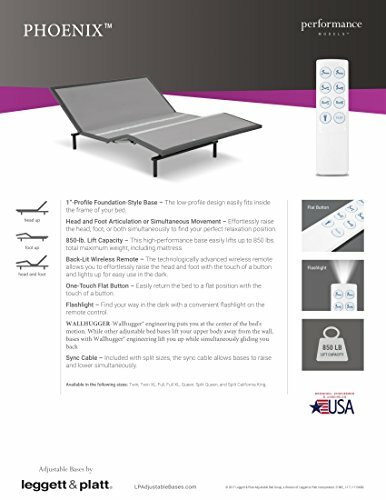 The Lucid L300 is a great all around affordable power adjustable bed base. Its made of steel and polyester. It incorporates special folding hinges for easy inexpensive shipping. Its easy to assemble, taking about 5 minutes to put together. It comes with head incline to 60 degrees and feet incline to 45 degrees. It also includes dual USB stations on both sides of the bed which is super convenient. It comes with a wireless remote that features a flashlight. The great thing about this base is that you can put together two Twin XL’s to make a king size split. You can do this at a considerable savings to other split king bases. 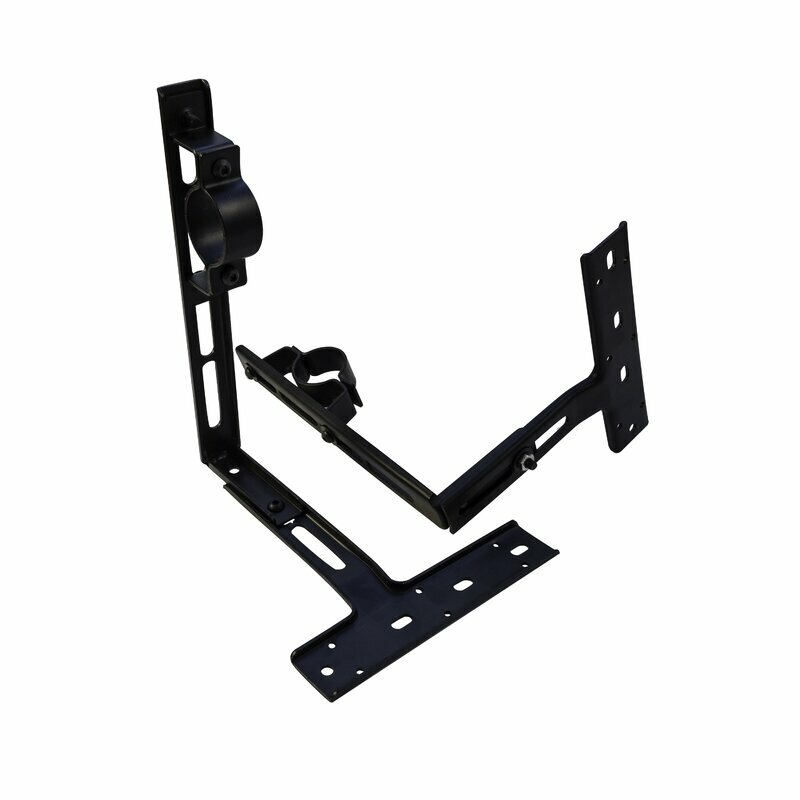 It has received many great reviews and is a solid choice for adjustable bases. Its our #2 Winner because there have been some complaints about build quality. This base works perfectly with Lucid foam mattresses that I reported on in this article. The Hofish adjustable powered bed base is an easy to assemble well designed base. The assembly is a three minute tool-free process. Its motors can lift up to 750 lbs. Its a super affordable option if you’re looking to save cash. It comes with 2 USB ports on each side of the bed. The remote is wireless and backlit. There are 9 auto programs as well as 2 custom programs. It takes our #3 Winner spot because it doesn’t have as many size options and doesn’t come with a split size option. If thats not a deal breaker for you this is a highly reviewed (mostly 5 star) product, and is sure to do a great job for you. Adjustable beds really go a long way in helping you achieve a greater sense of well-being. The certainly help with a number of physical conditions and also help people to sleep better. Sleeping better is a very important thing for people suffering from anxiety. I hope you enjoyed my report and will be enjoying your new adjustable bed soon. Want to know more about Adjustable Bed? Are Adjustable Beds Good for Side Sleepers? Yes!